Fig 1: Khenpo Tsültrim Lodrö blesses the fish prior to release. 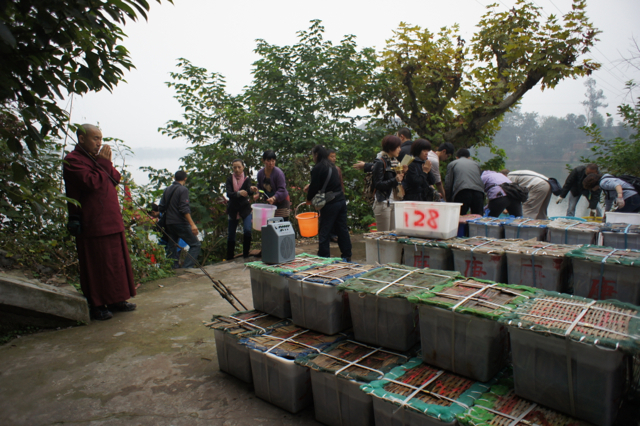 Over the past several months, a group of Khenpo Tsültrim Lodrö’s chinese disciples have been releasing fish into a lake just south of Chengdu. And not just a few fish either. Each day for one hundred days, they released something on the order of half a million small fish. That’s a lot of fish that will no longer become part of someone’s dinner. In line with traditional Tibetan tsetar practices, prior to releasing them, Khenpo Tsültrim Lodrö and his disciples offered extensive prayers for the fish’s present and future well-being (see fig 1). They were then loaded on a boat and transported out into the lake and released (slowly, so as not to harm them in the process. see fig 2). 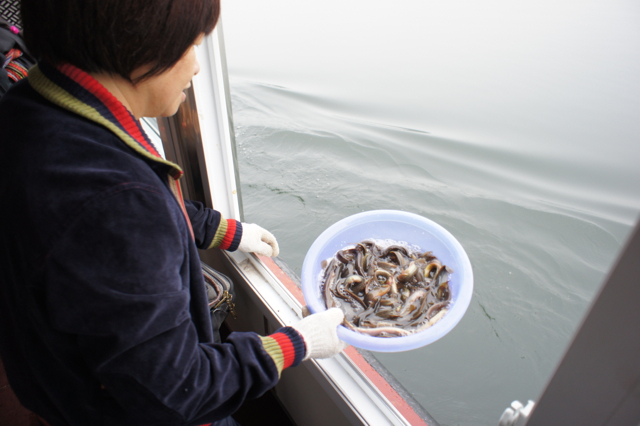 Two points are also worth noting at the outset: first, I was assured that the fish were of a species native to the region, and second, each day they were released into a different part of the lake, so as to minimize the impact on specific areas. Still, releasing half a million fish a day into a lake, even a large one like this, is bound to have an impact on the local ecosystem. Fig 2: A basket of fish ready for release. And therein lies one of the more interesting things this practice reveals: a difference between Tibetan and Western attitudes towards the natural environment and the animals living in it. 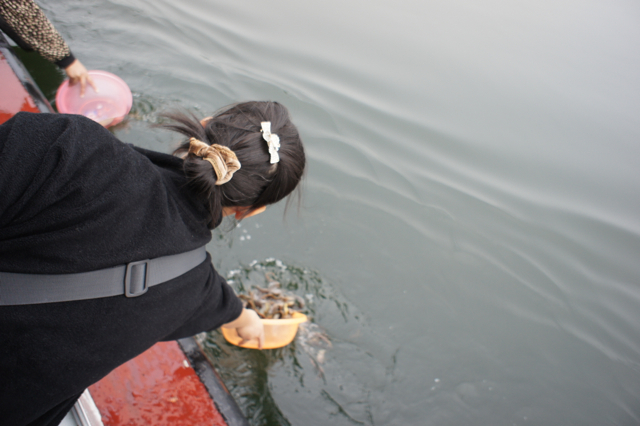 When I discuss these fish liberation episodes with Tibetans, they are overwhelmingly pleased with the number of fish being rescued. My foreign friends, on the other hand, tend to be horrified at the presumed damage being done to the lake’s ecosystem. Admittedly, these have not been formal, statistically rigorous surveys, and I’m sure I’m opening myself up to charges of simplification, essentializing Tibetan culture, and other grave academic faults. But I do think I’ve spoken with enough people to observe a basic pattern: Tibetans are primarily concerned with the individual animals while foreigners are more concerned with the well being of the ecosystem. It could be suggested that this difference is due to scientific ignorance on the part of the Tibetans, who might be unaware of the impact of releasing fish, but from the conversations I’ve had, I don’t think this is the case. Several of the Tibetans I’ve spoken to (including Khenpo Tsültrim Lodrö) have understood that releasing fish into the lake impacts the lake overall, but have argued that the benefit to the fish being released outweighs this concern. So I think I’ll stick with my guns and my oversimplified, stereotyped distinction. Fig 3: Slowly pouring fish into the lake. What makes this even more interesting, to me at least, is that it largely (if imperfectly) mirrors a debate in western environmental ethics. Some ethicists, such as Peter Singer, have argued that it is an animal’s ability to suffer (or experience happiness) that gives it moral value, and that justifies it’s protection. Thus, an ecosystem (lacking an ability to suffer in its own right) is not inherently valuable in itself, but only in it’s ability to impact the lives of the animals that live in it. We save ecosystems for the sake of the animals, not vice versa. Deep Ecologists (and others), on the other hand, see primary moral value lying in the healthy functioning of an ecosystem as a whole.Individual animals are only a part of that system, and their individual suffering is secondary to the health of the ecosystem. Often, these two approaches line up well. After all, usually what is good for the ecosystem is also what’s good for the animals concerned. But every now and then conflict arises. A classic example is the culling of overpopulated animal populations, where a great deal of suffering is inflicted on a few individual animals so that the ecosystem as a whole can prosper. I might suggest that the release of fifty million fish into a lake is another example. You have a very significant reduction in suffering for fifty million individual animals (they don’t get cooked), but also the risk of destabilizing an entire lake’s ecosystem. Given that the overwhelming majority of my western friends expressed more concern about the ecosystem than the fish, I think I am safe in suggesting that something akin to the Deep Ecology perspective (if not necessarily as radical as a true Deep Ecology position) has become fairly standard among educated westerners. So what is the point of this long ramble? Not much really. Merely to observe an interesting similarity between what I have been hearing from Tibetans and Singer’s perspectives on animals. Obviously, these are just observations, so I don’t want this to be construed as a definitive statement of ‘Tibetan thought’. I do, however, want to suggest that there might be an interesting kinship between at least some aspects of Tibetan Buddhist attitudes towards animals and Singer’s approach. The Deep Ecologists have long invoked Buddhist notions of dependent origination (give skt / Tibetan) to support their theoris of a deeply interdependent biosphere, and to underscore the importance of using ecosystem health as the baline for making environmental decisions. Perhaps Singer and his followers could also look to Buddhist thought in support of their theories. This comes out in Singer’s most famous work, 1975’s Animal Liberation, but is more explicit in his 1979 book Practical Ethics. This idea has its roots in Aldo Leopold‘s thought, but is now widely represented by many different strands of environmental ethics. It is perhaps the Deep Ecologists who take this idea to its extreme, arguing not only that a functioning ecosystem is the baseline unit of moral value, but that the nature of that functioning is beyond the range of scientific thought. The story goes something like this: killing is bad, and no one wants the karma of intentionally killing an animal. But you gotta eat, and that means meat. So what’s a poor Tibetan herder to do? It’s simple, really. 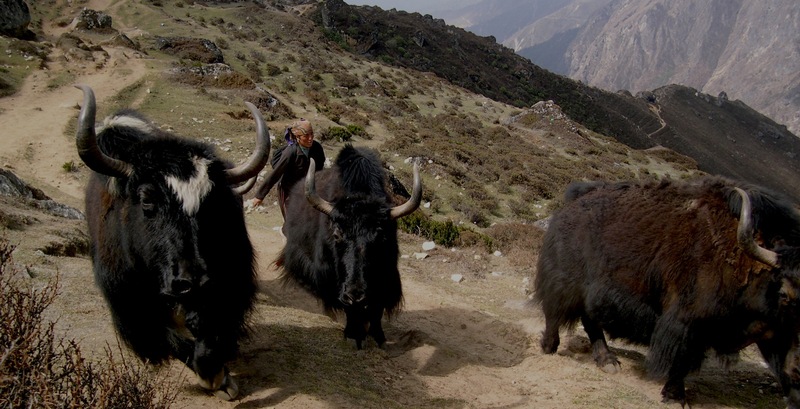 You take your yaks out to graze, and lead them close to some high cliffs. If all goes well, one of them will lose its footing and fall. You get the meat, and since the yak died ‘accidentally’ you gets a clean conscience to boot. I’ve heard this story on a couple of occasions, and have always wondered if it is true, or if it might fall into that amorphous category we call urban (rural?) legend. A European once told me he had read that Tibetans never killed animals. He added that, if any meat was needed, they would drive one or two yaks up a mountainside, shout at them from behind. Because this frightened the animals they fell, meeting their death in an abyss. The yaks could now be eaten – no sin was committed because they had killed themselves. However, I never came across this practice and never met a Tibetan who had. So there we have it, a well-travelled Tibetan, writing in the mid nineteen twenties, who claims that this story is bunk. Not quite enough to completely dismiss such stories, but better than anything else I’ve got. Fortunately, Karma Sudhön Paul gives us a clue about where this story might have come from. The unnamed European said he had read about this. In the late nineteenth and early twentieth centuries, Tibet was largely inaccessible and, to European eyes, shrouded in mystery. Needless to say, may of the books about Tibet that were circulating at the time had only a tenuous connection to reality. So perhaps it was one of these authors, trying to reconcile Tibetans’ love of meat with a nineteenth century view of Buddhism as fundamentally pacifistic and docile, who came up with this story, which has since be retold often enough to pass into the realm of urban legend? Or perhaps not, but stranger things have happened. Do you know which book this story might have come from? Or do you have any evidence that this might be a real practice after all? Let me know in the comments section below. For more information (and graphic photos) about actual Tibetan slaughtering practices, see: Goldstein, Melvyn C., and Cynthia M. Beall. Nomads of Western Tibet: The Survival of a Way of Life. (Berkeley: University of California Press, 1990), especially pages 96-99. Somewhat incredibly, the whole book appears to be available from google books. For a recent appeal by Khenpo Tsültrim Lodrö, one of the foremost lamas in Kham today, to make those practices more humane, see: tshul khrims blo ’gros. “dus su bab pa’i gtam lugs gnyis gsal ba’i me long [Timely Advice: the Mirror Illuminating the Two Systems].” In dpal bla rung gi mkhan po tshul khrims blo ’gros kyi gsung ’bum bzhugs so. Vol. 2. (ya chen o rgyan bsam gtan gling, ). This latter text might be hard to find, but should be available through Inter-Library Loan. Richardus, Peter, ed. Tibetan lives: Three Himalayan Autobiographies. Richmond: Curzon, 1998. Preview available on Google Books.